One of my favorite parts of Halloween are the spooky treats. 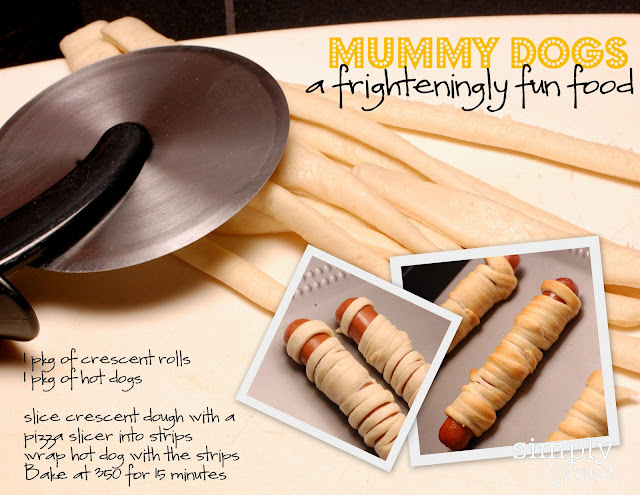 We have a tradition in our house, each Halloween we make mummy dogs. They have quickly become a seasonal favorite at our house. They are super easy to make and a lot of fun to eat. and 1 pkg of hot dogs. Slice the crescent dough into this strips using a pizza slicer (this is my daughters favorite part). Then wrap the strips around the hot dog. It doesn't have to be perfect, and is a great job for your little ones take on. Bake in the oven at 350 degrees for 15 minutes. For dessert we whipped up a batch of mummy cupcakes, I found a kit at my local Target. While the cupcakes were baking we went on a scavenger hunt around the house. I challenged my daughter to fill her plastic cauldron with as many M words as she could find...she went around the house and found a mermaid, muffin, manatee, moose and a microphone. Playing quick games like these when you need to occupy your little ones for a few minutes can buy you some extra time. Before we knew it the cupcakes were done and ready to be iced. Little man enjoyed his cupcake. He just couldn't get enough! Stop by our pinterest boards for some spooky inspiration for Halloween. We have a lot of ideas for some ghoulish fun! 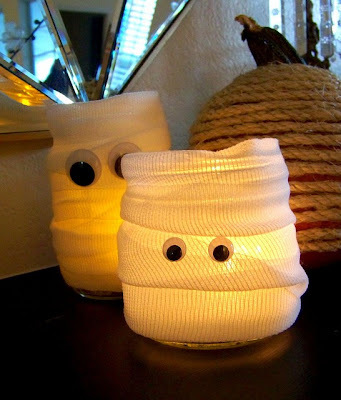 If you are looking for a fun and easy afternoon craft to tie into your mummy themed Monday make a mummy candle holder. Use old glass jars and wrap with gauze add some google eyes and a tea light candle. The perfect spooky addition for your fall decor.